Limited Run Games revealed this morning that it will be producing an exclusive physical run of Jak II for the PS4. This PlayStation 2 classic will come in standard of collector’s editions, and will be going on sale this Friday, January 25. The first batch will go live at 10AM Eastern, and the second batch will go up for sale at 6PM Eastern. You will want to set an alarm if you plan on snagging one. 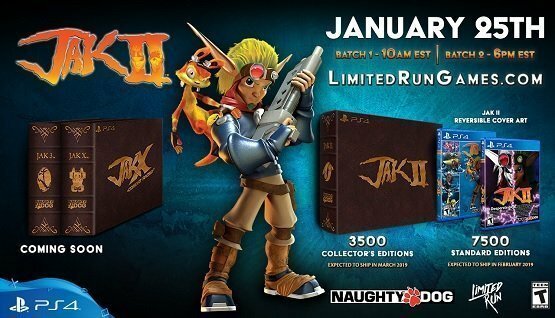 There will only be 3,500 units of the Jak II Collector’s Edition produced, so expect them to sell out very quickly. Included in the beautiful, foil-stamped box is Jak II, an official expanded 3-disc soundtrack, a Jak II “Design Bible,” a 3″ antique copper Seal of Mar, and “other goodies.” All of this will set you back $84.99. The price may be a little steep considering you can download the game right now on PSN for $14.99, but for collectors and fans of the series, the extra goodies are worth it. The Jak II Standard Edition will also be up for sale this Friday, and boasts a reversible cover. There will be 7,500 units of the standard version produced, and those are expected to ship out as early as next month. If you’re ordering the Collector’s Edition, expect your box to ship out some time in March, if everything goes to plan. We have no doubt that both versions of Jak II will sell out quickly. So what do you think? Are you going to be setting your alarm and trying to snag a copy for yourself, or are you content to simply download the game from the PlayStation Store? Let us know what you think of Limited Run Games’ latest offer in the comments below, or chime in on Facebook and Twitter!